The latest DC Comics ARTFX+ Statue from Kotobukiya returns to the pages of the New 52 with a popular and colorful character, the GREEN ARROW! Introduced all the way back in 1941, billionaire Oliver Queen was marooned on a deserted island and there learned to survive by the way of the bow. Taking those skills back to civilization after being rescued, “Ollie” would take on the identity of Green Arrow and fight crime in Star City and Seattle, though his adventures with the Justice League would take him all around the world and beyond. In the New 52 Green Arrow continues to defend the innocent as he investigates the truth of his past and what shaped him as a hero. The Emerald Archer appears for the first time in the ARTFX+ lineup, posed with a wide stance as he scans for enemies and prepares to draw an arrow. Oliver wears his New 52 costume featuring a black and green outfit that leaves his arms mostly bare for shooting. With reinforced boots, a padded chest piece, and armored gauntlets Green Arrow is ready for anything, and the gold accents shine on his buckles and arrow emblem belt buckle. The archer holds his bright green bow sideways in front of him, ready for nocking an arrow from the full quiver on his back. 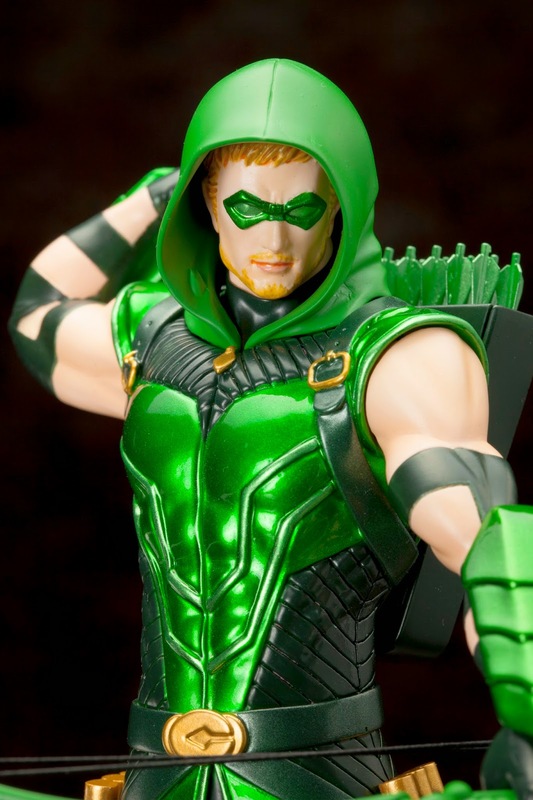 Wearing his trademark green hood and mask, the focused hero still shows off a bit of his blonde hair and scruffy beard.